Category Archives: Jesus, Yeshua or Yahshua? Since Jesus was born into a Jewish family, what was His real name in the Hebrew language? Those in the Sacred Name Movement (a sect of Christianity) aggressively oppose the use of YESHUA claiming that this is incorrect and the result of a Jewish conspiracy to hide the Savior’s true name. They insist that YAHSHUA is the correct name and should be used instead. Although no such conspiracy ever existed regarding Jesus’ name, they endlessly argue about this and even separate themselves from other believers who don’t adhere to their viewpoint. Is “Jesus” a pagan name? God forbid! Opponents of the use of YESHUA also teach that the name “Jesus” has a pagan connection and should never be used. This is another false accusation that can be disproved historically and linguistically. 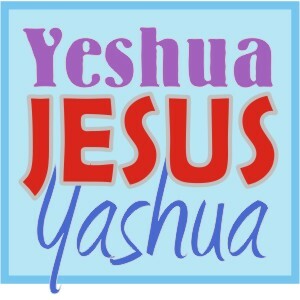 The English form of JESUS is derived from the Greek name “Yesous”, which was transliterated from the original Hebrew (shortened) name of YESHUA that was given by God to our Savior when the angel Gabriel appeared to Mary: “She will give birth to a son, and you are to give him the name Jesus, because he will save his people from their sins” – Matthew 1:21. I agree with Dr. Botkin’s conclusion in his article* that, in this case, we are arguing about petty matters that are not really important to Christian unity, and “splitting hairs” over issues that matter little to God. The apostle Paul warned us against the evil of creating division in the Body of Christ over such menial issues. Those who become obsessed with trivial disputes and arguing over petty differences in words will eventually grieve the Holy Spirit and become men of corrupt minds, destitute of the truth (1 Timothy 6:3-5). Without compromising sound doctrine, believers in Jesus the Messiah should live humbly and gently, always endeavoring to maintain the unity of the Spirit in the bond of peace whenever possible, by bearing one another’s minor differences in beliefs and walking in love. (Ephesians 4:1-5). Categories: Jesus, Yeshua or Yahshua? | Tags: Contention, Dr. Ben-Gigi, Dr. Daniel Botkin, Dr. David Bivin, Ephesians 4:1-5, False Doctrines, Greek, Hebrew, I Timothy 6:1-5, Jesus, Lord, Matthew 1:21, Messiah, Movement, Name, Sacred, Savior, Strife over words, Yahshua, Yeshua | Permalink.